Bradford improved their season record to 12-0-1, to stay undefeated in regulation with their victory over the Lefroy Wave. 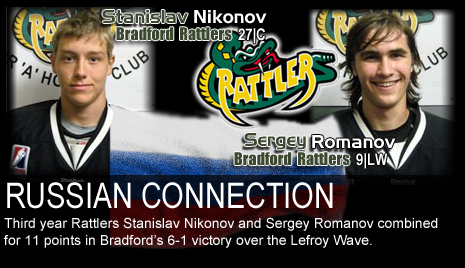 Russians Stanislav Nikonov and Sergey Romanov led the Rattlers to the 6-1 victory. Bradford outshot Lefroy 50-27; dominating the first year expansion club. Over two matches this season, the Rattlers have outscored the Wave 10-2, winning both games. These clubs will square off four more times before seasons’ end. After one period of play, the teams were all square at 1-1; with German forward Alexander Bangert scoring for the Rattlers, and Josh LaFrance for the Wave. Bradford exploded in the second period, scoring four goals to Lefroy’s zero. Nikonov scored three; while Bangert notched his second of the game. Romanov assisted on all four second period goals. In the final frame, Romanov scored one of his own, to have a final score of 6-1 Bradford. Sergey Romanov’s six point performance overtook Conor Smith as the team’s point leader. Romanov now has 27 points (8g, 19a) in 9 games. Carson Bird started the game in goal and was rewarded the third star of the game. Bird made 26 saves for a .963 save%. Defenseman Ugo Jaffeux dropped the gloves with Lefroy’s Cody Burtch in the second period. Both players were given game ejections following the fight. Bradford continues their drive for the Russell Cup next Sunday; when the Temiscaming Titans come to town. The two clubs are far believed to be the favorites to win the league this season and the game should be one of the most skilled games of the season. Temiscaming is a perfect 14-0-0, against Bradford’s 12-0-1. This will be the first match-up these franchises have ever had against each other. Come out and support Bradford in what promises to be one of the best hockey games of the year!